Run NFSCfgInstaller and look for your NFSU2 folder, then pick one of the confs on the CFG folder when asked. With NFS TexEd, open FRONTEND/frontb.lzc and look for ID 102 to replace it with the secondary logo provided. 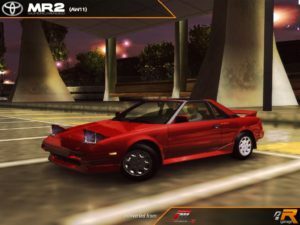 Restore all backups, run NFSCfgInstaller and look for your NFSU2 folder, then pick uninstall_Toyota MR2 Supercharged (AW11).u2car when asked.